Crimp Rigidity Tester of a textured yarn gives a measure of its ability to recover from stretch. This is determined by measuring the percentage reduction of length of a skein of yarn immersed in water when a major load is replaced by a minor load. For measuring crimp rigidity, a skein of known number of strands is prepared from the package of yarn under test. This skein is then immersed in water filled in glass jar with a load of 0.1 g/denier/strand suspended on it. The rubber scale stretched so that the zero mark on it is at the level of the bottom of the skein. The load is then reduced to 0.002 g/denier/strand by removing the major load and the reading on the sale observed. This reading gives the value of crimp rigidity. 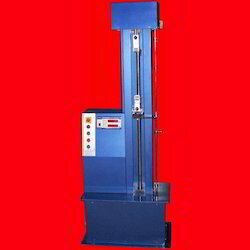 The “asian” Lea Strength Tester provides a relatively inexpensive way for determining the tensile strength and elongation of yarn. They are based on constant rate of traverse principle in which one end of the test specimen is held in a stationary grip, while the other end is made to move at a known fixed speed with the help of motor, gear box and screw arrangement. The load exerted on the stationary grip is sensed by a load cell and indicated by a digital load indicator. The controller is microprocessor based and has the facility of over load protection, peak hold and auto calibration. There is a socket in the indicator which is connected to the PC. The load directly indicated in kilograms or Newton. We provide the Window based software which give the different measurement parameter and the graph between load vs elongation. The report can be printout by using proper printer. 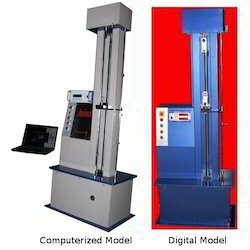 The "ASIAN" Digital Lea Strength Tester is suitable for determining the tensile strength & elongation of tea by using the constant rate of transverse principle. This equipments that have two grip one of which to the load measuring device and the other grip attached to the movable nut which is move it and fixed speed with the help of a motor worm reduction gearbox and screw arrangement. The load applied on the test specimen is determined by load cell and is indicate on a digital display. 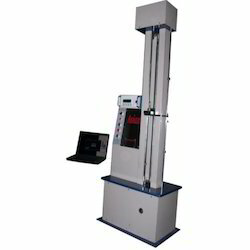 Single Yarn Strength Tester is use to measure the tensile strength and elongation which are the two prime characteristics of most of the raw materials, whether they are metals: or non-metals: such as foam, rubber, textiles, plastic, paper: or finished products such as rods, wires, ropes, yarns, belts etcetera. These properties very often play the major role in determining the suitability of any raw material for any specific application. It is therefore, of utmost importance to determine these characteristics accurately, conveniently, and quickly.